[ Thomas Henry Huxley, biologist ('Darwin's Bulldog'). ] 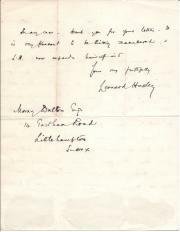 Autograph Note Signed ('T H Huxley') to 'Jones', regarding the whereabouts of 'Montagu I' and 'Montagu II'. 1p., 12mo. In fair condition, lightly aged and spotted, with traces of mount adhering to reverse. Reads: 'My dear Jones | Montagu II is in the Fruit Room | You have Montagu I I think? | Yours sincerely | T H Huxley'. Note: A Google search throws up the Fruit Room in the Topkapi Palace (Istanbul) associated with Lady Mary Wortley MONTAGU. Would the association be presumptious. 24pp., 8vo, disbound, foxed throughout (medium), ow good. INSCRIBED by Author, "Herbert Spencer Esqre | From the Writer". He refers to one of Darwin's works in a footnote on p.18. Also printed in "The Lancet". [ Desmond Harmsworth, publisher. ] Two printed catalogues: 'A First List' and 'Spring Books | Nineteen Thirty-Two'. Two stitched pamphlets of uniform design. 15pp., 12mo, and 19pp., 12mo. Tastefully printed, with covers in red and black. Both items in good condition, lightly aged and worn. The first volume - 'A First List' - has a full-page 'Advertisement' by 'D. H.', in which he aspires to 'offer a fair proportion of what is alive in modern writing - a hope which is my raison d'etre as a publisher [...] nothing, if not lack of sense, or lack of the desire, need stop one from printing whatever is available, and has intrinsic vitality or permanence'. [Professor James Richard Ainsworth Davis.] 'Application for the Biological Chair of the "University College of South Wales and Monmouthshire."' [by Banbury printers Cheney & Sons], with two leaves of 'Testimonials', including one by T. H. Huxley. Three pieces of Victorian educational and scientific ephemera, and nice pieces of provincial printing. All three items nearly fine. ONE: 'APPLICATION for the Biological Chair of the "University College of South Wales and Monmouthshire."' Dated from Calthorpe Road on 17 August 1883, and addressed to 'IVOR JAMES, Esq. | Registrar, | University College of South Wales and Monmouthshire.' 1p., 4to. On bifolium. Two Autograph Letters Signed ('Horatio Hale' and 'H. Hale') from the ethnologist Horatio Hale to the Boston merchant W. W. Greenough, discussing matters including a future Lowell Institute lecture. With carte-de-visite photograph of Hale. Letter One: 22 December 1882. Letter Two: 15 November 1886. Both from Clinton, Ontario, Canada. All three items in good condition. Letter One: 22 December 1882. 7 pp, 12mo. On two bifoliums. In this letter Hale explains his reasons for turning down, despite the urging of his friends, the invitation to give 'six lectures, suitable for a Lowell Institute course'. He begins by apologising for not answering as a result of illness: 'this is the first time for ten years that I have been kept from attending my office by such a cause'. Since his 'Indian researches have become known' he has had many calls upon his time: 'I now find that I have been attempting too much.